The East Texas Highway was created in June 1917 when the Texas Highway Commission announced the establishment of the state's first highway system. It was designated as SH 8 and was the easternmost of the three north-south highways that the Commission created at that time; the others were SH 2 (Meridian) and SH 5 (Del Rio-Canadian). Although the northern third of the East Texas Highway generally followed a straight north-south path from the Red River and Oklahoma border to the Harrison-Panola county line, the rest of the highway paralleled the Sabine River as it flowed to the Gulf of Mexico. 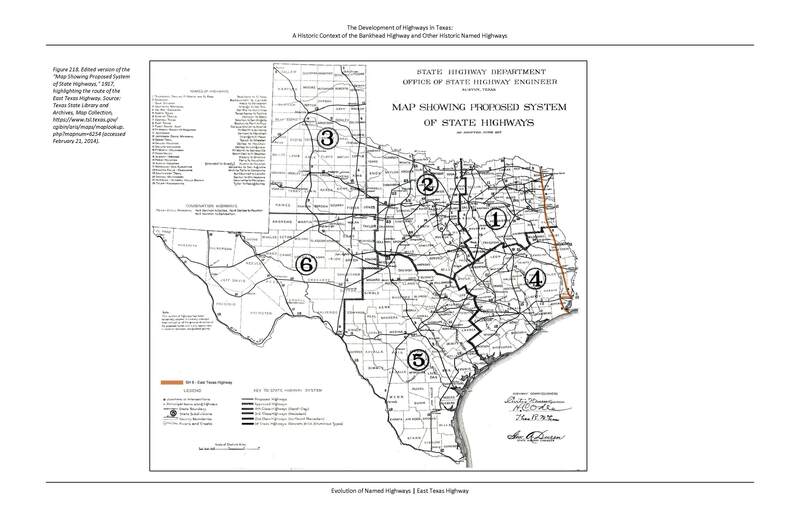 Unlike SH 1 (Bankhead), SH 2 (Meridian), and SH 3 (Old Spanish Trail), the East Texas Highway was not a transcontinental highway; rather, it primarily served a specific geographic region of Texas. The highway linked some of the oldest and most active communities in the region at that time including Port Arthur, Beaumont, Orange, Jasper, San Augustine, Carthage, Marshall, and Linden. This route extended through heavily forested land that was sparsely populated and relatively difficult to clear.